Free Viewer » Blog » How to Resolve Unable to Mount Database in Exchange 2016, 2013, 2010, Error? How to Resolve Unable to Mount Database in Exchange 2016, 2013, 2010, Error? To fix the error: Unable to mount database in Exchange 2016, 2013, 2010, 2007, 2003, it is necessary to have a clear understanding of the importance of transaction logs. Life of Exchange server is its transaction log. It is the real reason that retains smooth processing on Exchange server. Every transaction made to the server is written in log files in database. These files remain in the system memory unless transaction is not saved in Exchange database. A user loses all the contents from memory if a sudden rupture of server occurs as data was not entirely archived. Thus, transaction logs are the quick repair mechanism to safeguard data to an Exchange database, that retains smooth processing on Exchange server. Every transaction made to the server is written in log files in database. It is a fact that an EDB file is responsible for storing data in the form of user mailboxes in Microsoft Exchange Server. All we want to say is that database play a primary role in a company as it stores all communication information regarding personal and business purpose. However, if EDB files undergo any corruption issues then all Exchange data including emails, images, attachments, personal information, tasks, etc. become entirely out of reach. In Exchange 2010, the server becomes unable to mount database sometimes. To prevent such a situation from happening, we have come up with different solutions to resolve the error unable to mount database in Exchange 2010. All these resolution methods aim to recover all damaged data back to its original form. But before this, let us go through this user query to get a deeper understanding of this issue, that retains smooth processing on Exchange server. Every transaction made to the server is written in log files in database. I Had a serious issue with the drive where Exchange databases were running quite out of space. So, I created more space and expanded it. 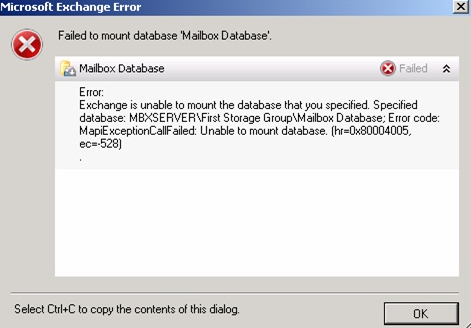 But to my disappointment now, I am getting messages that server is unable to mount database in Exchange 2010. Does anyone know what should I do? Please suggest an easy solution to me for this problem. What Causes of Unable to Mount Database in Exchange Error? Suppose a scenario in which MS Exchange 2010 in a company server abruptly crashed and a person tried mounting the database file by the help of Exchange Management Console then, an error message knocks on the system screen. Quarantined database file due to anti-virus application. Because of the old Raid Controller driver. Corrupted Exchange server database file. Solution #1: One common cause is deletion of transaction logs that causes database mounting to fail. To fix this issue, it is necessary to execute a consistency check. Removal of the transaction log is a prominent reason because of which the database mounting fails. It is extremely vital to first do a consistency check by Eseutil tool to resolve the issues.This is of utmost help in resolving the Exchange 2010 error by remounting database after its sudden halt. If database is still not mounted then, check consistency of transaction logs. Solution #2: At a safe location, just create a duplicate copy of current database file before starting the solution method. Hence, following are the few solutions that a user can look up to for resolving such an issue. If the dismounting Exchange database error still persists and user does not have the recent backup of files then, go for the commercial tool Exchange EDB Recovery to resolve all the issues with EDB files and folders. This tool is further explained in the next segment of the article. Solution #3: This Software is one of its kind tool to open and view Exchange EDB mailbox items including email messages, calendar, tasks, notes, journals, etc. It is adept to view both Public and Private folders of Exchange server database. It also bestows users with an Advanced Scan option to repair corrupted EDB database. Moreover, this software has no limitation on the size of file. It is far from complexities of the manual method where non-technical users may get terribly stuck. Thus, it is an all-rounder tool to fix ‘Unable to mount database in Exchange 2010’ error message. Now, whenever an error message crops up describing the failed attempt in mounting Exchange 2010 database, you know exactly what to do. Thus, in this content, three proficient solutions have been summed up. However, it is advised to go for the mentioned tool to minimize the time taken and maximize productivity while resolving the Unable to mount database in Exchange 2010 Error.